The latest IPA Bellwether reports that a balance of only 8.6% of companies raising budgets in the last quarter of 2017, the lowest it has been since the start of 2016. While 23.9% of marketing executives raised their budgets during the latest survey period, cost pressures led 15.2% to cut their total marketing budgets. "Looking at quarter-on-quarter results it is clear that uncertainty from the wider geo-political situation continues to affect a cautious approach from marketers regarding their budgets," Paul Bainsfair, IPA director general, said. "That having been said, we must take comfort in the fact that budgets have been revised up overall in Q4 and that as ever the ability for advertising to drive business growth cannot be underestimated." For 2018/19, nearly 38% of the survey panel are forecasting an increase in marketing budgets, compared to 15% that are anticipating a decline, for a resulting net balance of +23.3%. New product launches and wider business initiatives were widely reported as reasons for optimism. Media-wise, marketing executives are anticipating growth across all categories except "other". Direct marketing (+16.7%) is expected to benefit notably from the uplift in overall budgets, which some panellists attributed to GDPR and the resulting opportunities to focus on personalised communications from compliant and secure data. Elsewhere, main media advertising (+1.7%) is also expected to expand, but growth will move towards digital marketing tools. 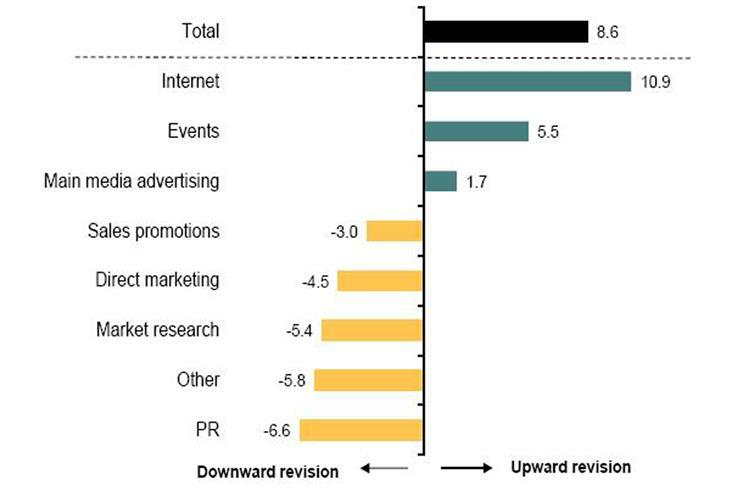 More modest growth is seen in sales promotion (+6.6%), PR (+4.3%), market research (+3.3%) and events (+3.1%). The reported figures are "disappointing but not unexpected," Dame Cilla Snowball, group chief executive at Abbot Mead Vickers BBDO told Campaign. There is still cause to hope for a stronger 2018 because, while predicted growth is low, it's still "early days", she added: "This time last year, Bellwether forecast 0.6% growth in 2017 – a figure it subsequently revised upwards, to 1.4%." If budgets continue to shrink however, agencies should focus on "doing great work across all channels, getting results, driving revenue growth and managing cost tightly’," Snowball advised. James Murphy, chief executive at Adam & Eve/DDB, agreed with Snowball. "These numbers don’t change the fact that the best agencies will continue to thrive as will the best clients. Those agencies need to confidently prove value and effectiveness to clients like never before…. and those clients need to prove the same to their organisations like never before." Brexit remains a dominant concern for respondents, with most worried about the general uncertainty caused by the negotiations. A number of panellists added that clients were unwilling to make decisions given the uncertain economic environment. There were, however, panellists who were positive about Brexit and saw opportunities for growth, in part stimulated by a weaker pound which may boost tourism. Opportunities for increased trade with markets outside of Europe were also mentioned. GDPR drew a mix of concern and optimism. While some are worried the regulation will make it harder to contact potential clients, others view it as providing an opportunity to win business from competitors and improve their direct marketing to potential customers. Rising prices were also a cause for worry, with fears it will depress sales and demand. Higher costs to import were also viewed as a business threat, particularly in retail. Finally, several companies expect positive investment returns from increased digital marketing over the coming 12 months.